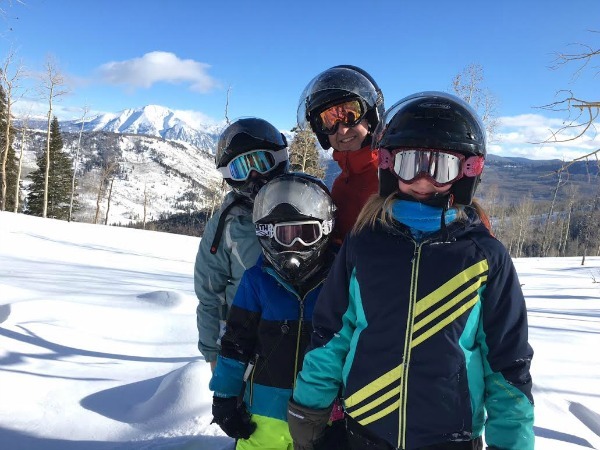 Mile High Mamas has frequently touted Sunlight Mountain Resorts’ Ski, Swim and Stay package as Colorado’s most affordable family ski vacation (normal rates start at just $99 and kids 12 and under ski free). However, it wasn’t until last weekend that we could finally personally endorse this staycation at Glenwood Hot Springs Lodge, Pool and Spa that includes swimming at the world’s largest natural hot spring and a whole lot of family fun. Colorado’s megaresorts often get all the glory while many of our state’s smaller “Gem” resorts get overshadowed. 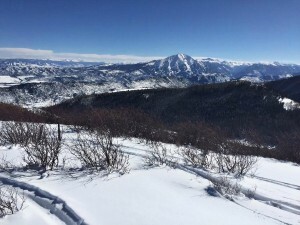 Just 12 miles outside of Glenwood Springs, Sunlight Mountain Resort flaunts a full day of skiing for half the price without the lines and parking fees. Sounds too good to be true? I almost thought it was when my family arrived at this local’s mountain and glanced warily at the mere three chairlifts on Compass Peak. I was happily proven wrong. By day’s end, we had barely put a dent in the 67 trails on 680 skiable acres. The terrain is varied with about 75 percent rated as beginner or intermediate–from gentle pitches to steeps–with stunning views of 12,966-foot Mount Sopris in a feather-light duvet of white. The terrain park offers jump lines that are small (for mom), medium (for daughter) and large (for son). After skiing for a couple of hours with bubbly mountain hostess Ivy, we wanted to ski some trees. “I have just the place!” and she took us to Joslin Glades where we stopped (literally) in our tracks. “You realize this is a double black diamond run,” Hadley choked out. “I’ve been with you all morning. You’ve got this,” Ivy reassured. 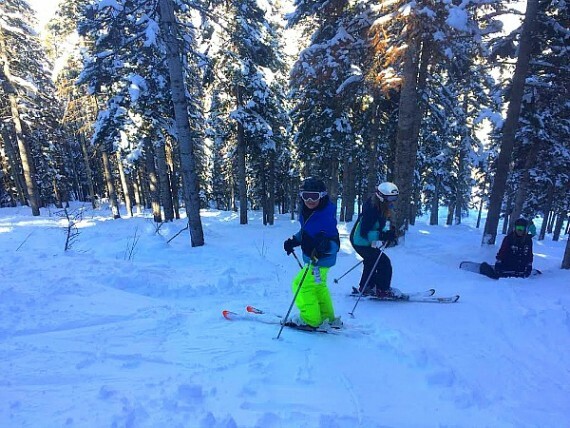 And that is how my kids skied their first ever extreme terrain, slowly navigating the well-spaced evergreen glades so narrow it was like entering an elevator shaft of powder. The kids emerged shocked, triumphant and bathed in the memories of that forest for many years to come. All trails lead to the base so Sunlight is the perfect place for kids to flex their independence by skiing without Mom and Dad. The 2.5-mile beginner Ute trail was once the longest run in Colorado. Sunlight is home to Heathen, one of the steepest runs in the state on the resort’s famed East Ridge with a 52-degree pitch. My daughter raved that her bacon-cheeseburger at the Grill was the “best ever,” while the red chili and onion rings won my vote. 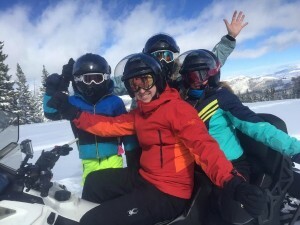 Go to Sunlight Mountain Resort’s TripAdvisor page and you’ll find raving endorsements for their snowmobile tours, otherwise known as “Smile-mobiling.” Cheesy pun aside, this might be the most fun you’ll ever have on a snowmobile with their one-hour Family Tour or 2.5-hour Adventure Tour. We opted for the latter. 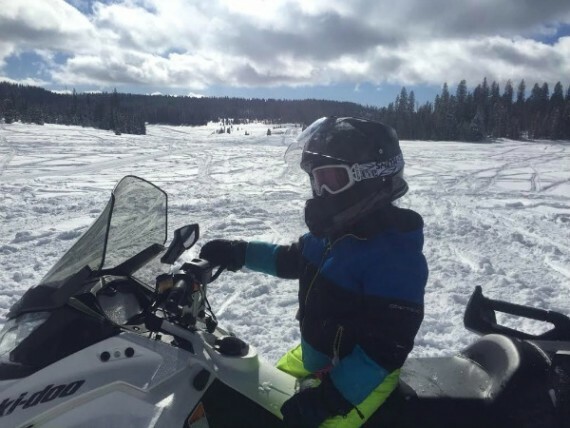 After getting outfitted with helmets and a debriefing on our Ski-Doos, we set out along the freshly groomed trail to explore the White River National Forest’s whirl of white. Our guides Tyler and A.J. adapted our tour to our comfort level, allowing us to frequently gape at the 360-degree views of Mount Sopris, the West Elk Mountains, the Flattops Wilderness Area and the Tri-County Point, a unique geographical location where three Colorado counties (Garfield, Mesa and Pitkin) meet. The climax of our 30-mile adventure was when we arrived at Baylor Park’s expansive meadow, a scene that could have been lifted from a classical landscape painting were it not for my kid-in-a-candy-store husband free riding at top speeds. Our kids were thrilled to switch places and drive for the first time, leaving snowy billows behind our snowmobiles in powdery contrails. Unfortunately, our storybook day did not have a perfect ending when, on our ride back, my husband and son’s snowmobile slipped off the groomed trail. Ty and A.J. quickly went to work, leveraging it out of the powder with various tools. Bode and the snowmobile emerged unscathed while Jamie had a bloody lip and banged-up knee but was still in good spirits. “Kids, your dad protected Bode from getting hurt. He did what’s called ‘taking one for the team,’” I observed. “I’m the best airbag ever,” Jamie boasted. Rand McNally and USA Today recently voted Glenwood Springs the Most Fun Town in America so what’s all the fuss about? Glenwood Springs is a real ski town but without the steep prices and pretentious attitudes. Average room rates are still under $100, so that means you can afford to get out and enjoy yourself. Glenwood Caverns Adventure Park is a year-round attraction with rides, an alpine coaster and laser tag that complements a long list of mountain activities. Hot springs gush from the earth in Glenwood Springs and no visit is complete without a soak at Glenwood Hot Springs Resort. The historic sandstone bathhouse has been completely renovated and the spring delivers three and a half million gallons of hot water every day to the pool.Tip: The minerals did wonders for my husband’s sore muscles, as did a massage at their Spa. Stay at the 107-room Glenwood Hot Springs Lodge for easy access, best prices and a free breakfast buffet. We also indulged at Iron Mountain Hot Springs, the area’s newest hot spot with 16 mineral hot springs soaking pools of various temperatures. Our timing was perfect. As we soaked in the freshwater family pool with a jetted spa overlooking the Colorado River, the town’s annual fireworks display was shot from nearby Two Rivers Park in conjunction with the Sunlight Mountain 2015 Ski Spree. Put this weekend on your agenda for next year. One-of-kind shops and restaurants abound in historic downtown. You’ll find some of the best burgers (with 18 dipping sauces) and adult shakes in Colorado at the GRIND where they locally source grass-fed beef, butcher everything in house and GRIND them fresh every day. There is a small arcade in the back and guaranteed, your kids will be begging for more of their balsamic and honey-dressed Brussels Sprouts. Chalk up all these adventures and eats for one big, sunny win at Sunlight Mountain Resort. Thanks to them for hosting and congratulations to our grand prize winners for our Sunlight Ski, Swim and Stay contest. We love Glenwood Springs. We visited two years ago and my kids have been begging to go back. Our favorite thing to do was the alpine coaster! Did you prefer one hot spring over the other? We’ve long called Sunlight Colorado’s best-kept secret. It’s never crowded and lift tickets are cheap cheap cheap. It would be nice to see some upgrades on the lifts but so long as those lift ticket prices stay low, we’ll keep going there. Can’t beat those package prcies. I entered your grand prize giveaway but didn’t win. Thinking I’ll need to just spring and go for spring break. Jen–No preference on hot springs. They both are so different. 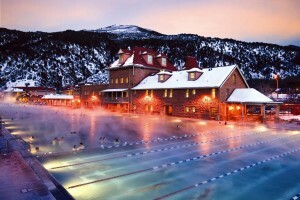 Glenwood Hot Springs is great for the historic element, it’s huge and gorgeous. Iron Mountain. I thought it wouldn’t be kid-friendly with the smaller soaking pools and some were definitely crammed with adults. But there were plenty of kids, especially in the family pool. Super busy on weekend nights and with the smaller pools, it shows. Candace–I love seeing true local’s resorts. We will definitely be back. Sandy–Spring Break would be perfect. Colorado has had such a great snow year that hopefully it holds out. Hi, we’re planning a trip into the Denver, CO area over spring break. We have an 9 yr old girl and two boys ages 7 and 4. Which of the many places do you recommend for snow fun!? Today. We Play. The first artist-driven dark ride the world has ever seen! Meow Wolf’s Kaleidoscape – Take the Ride 2019.